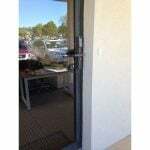 We install the Lock no problems and is working great. Thanks, all went well with the install. 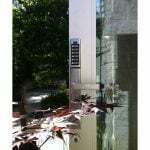 Keyless makes life simpler on these multi unit buildings! The key less lock model ( DL1200 ) that I bought was really nice, easy to install and most important my customer was happy with the product. I definitely will buy more stuff from gokeyless, in fact I’m looking for another key less lock for outdoors, one that the rain won’t damage it. 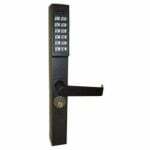 Answered by the admin Unfortunately, that handle is not compatible with DL1200 lock. The cam location on this lock is more readily tied into a panic bar. No, you would need the Adams Rite product E-Force-150. However, for exactly what you might need and what may work with your door we strongly recommend speaking with our highly qualified sales staff. You can reach them at 937-890-2333 opt. 1 for sales and they will be able to ensure that you get exactly what you need and exactly what will work with your door.